The United Nations Security Council is expected to vote Wednesday on a draft resolution that would require the UN chief to report monthly on whether Syria is co-operating with monthly chemical weapons inspections. A suspected Syrian government chemical attack killed scores of people, including children, in the northwestern province of Idlib on Tuesday, a monitoring group, medics and rescue workers in the rebel-held area said. The head of the health authority in rebel-held Idlib said more than 50 people had been killed and 300 wounded. The Union of Medical Care Organizations, a coalition of international aid agencies that funds hospitals in Syria, said at least 100 people had died. The incident "bears all the hallmarks" of an attack by the Syrian government forces, said British Foreign Secretary Boris Johnson. The Russian Defence Ministry said its aircraft had not carried out the attack. The UN Security Council was expected to meet on Wednesday to discuss the incident. Reuters photographs showed people breathing through oxygen masks and wearing protection suits, while others carried the bodies of dead children, and corpses wrapped in blankets were lined up on the ground. A senior U.S. State Department official said it appeared that the attack blamed on Assad amounted to a war crime. Prime Minister Justin Trudeau responded to the attack on Twitter. Canada strongly condemns the use of chemical weapons. The perpetrators of the horrific attack in Syria must be held accountable. He echoed a statement issued earlier by Minister of Foreign Affairs Chrystia Freeland, who said that Canada is "outraged by reports of a chemical weapons attack against civilians, particularly the senseless suffering and death of children in southern Idlib, Syria." "If confirmed, this new use of chemical weapons further weakens the credibility of the regime as a potential partner for peace," Freeland said in the statement. Mounzer Khalil, head of Idlib's health authority, said hospitals in the province were overflowing with victims. "This morning, at 6:30 a.m., warplanes targeted Khan Sheikhoun with gases, believed to be sarin and chlorine," he told a news conference. Warplanes later struck near a medical point where victims of the attack were receiving treatment, the Observatory and civil defence workers said. 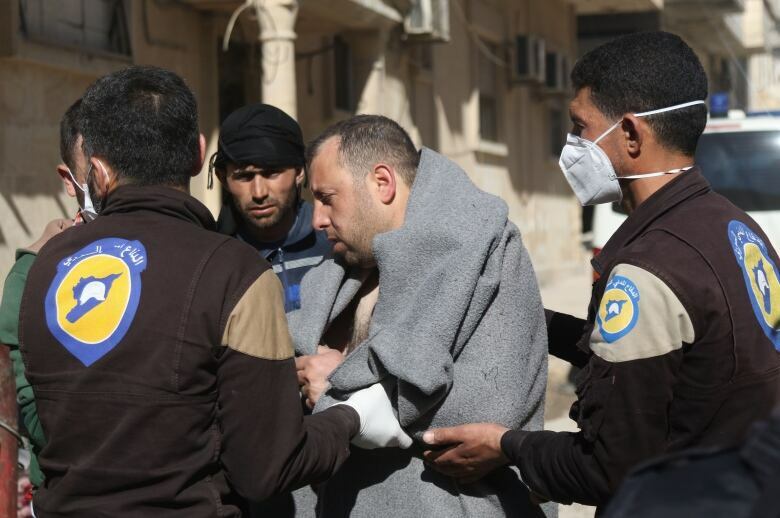 The civil defence, also known as the White Helmets — a rescue service that operates in opposition areas — said jets struck one of its centres in the area and the nearby medical point. Dr. AbdulHai Tennari, a pulmonologist who treated dozens of patients in the aftermath, said it appeared to be more serious than a chlorine attack. His hometown Idlib, some 54 kilometres to the north, has been the scene a number of chlorine attacks. Tennari said doctors are struggling to deal with the victims amid a shortage of facilities and medical supplies, and the antidote used to save patients is in short supply. The U.S. government believes the chemical agent sarin was used in the attack in Idlib, which was "almost certainly" carried out by forces loyal to Syrian President Bashar al-Assad, a U.S. government source said. The White House called the attack an "intolerable act" and said President Donald Trump was alarmed by the reports. The chemical weapons attack in Syria shows how Assad operates with "brutal and unabashed barbarism," U.S. Secretary of State Rex Tillerson said on Tuesday. He called on Russia and Iran to make sure it never happens again. "Those who defend and support him, including Russia and Iran, should have no illusions about Assad or his intentions," Tillerson said in a statement. "Anyone who uses chemical weapons to attack his own people shows a fundamental disregard for human decency and must be held accountable." French President Francois Hollande directly blamed Syrian government forces and said Assad's allies were emboldening him to act with impunity. Assad has enjoyed staunch military backing from Iran and Russia in the war. Britain said he would be guilty of a war crime if it were proved that his regime was responsible. British Prime Minister Theresa May called for an investigation into the attack. The United Nations envoy for Syria said the "horrific" chemical attack had come from the air. Late Tuesday the U.S., Britain and France proposed a United Nations Security Council resolution ''expressing horror'' and condemning the suspected deadly chemical weapons attack in Syria causing "large scale loss of life," which diplomats said is likely to be put to a vote on Wednesday. CBC has obtained a copy. The draft resolution asks UN chief Antonio Guterres to report monthly on whether the Syrian government is co-operating with an international inquiry into chemical weapons use in Syria. In February, Russia, backed by China, cast its seventh veto to protect Assad's government from council action, blocking a bid by Western powers to impose sanctions over accusations of chemical weapons attacks during the conflict. A series of investigations by the United Nations and the Organization for the Prohibition of Chemical Weapons (OPCW) found that various parties in the Syrian war had used chlorine, sulfur mustard gas and sarin. It also said Islamic State in Iraq and Syria had used sulfur mustard gas. The OPCW said it had begun "gathering and analyzing information from all available sources" about the suspected Khan Sheikhoun attack. Turkey, which backs the anti-Assad opposition, said the attack could derail Russian-backed diplomatic efforts to shore up a ceasefire. Turkey's state-run Anadolu news agency said 15 people hurt in the attack, mostly women and children, had been taken to Turkey. ​Footage from Turkey's Dogan news agency showed at least four people being brought out of ambulances on stretchers in the Turkish border town of Reyhanli by medical staff wearing face masks. One was a young boy. An official at the Turkish Health Ministry said Turkey's disaster management agency was first "scanning those arriving for chemical weapons, then decontaminating them from chemicals" before they could be taken to hospital. Idlib province contains the largest populated area controlled by anti-Assad rebels — both nationalist Free Syrian Army groups and powerful Islamist factions, including the former al Qaeda-linked Nusra Front. Turkish President Recep Tayyip Erdogan and Russian President Vladimir Putin discussed the suspected attack, Turkish presidential sources said. They said the two leaders had also emphasized the importance of maintaining the much-violated Syrian ceasefire.